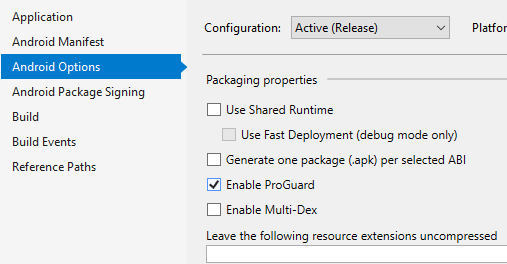 Note: Proguard is a file shrinker/optimizer which is often used on a release version. This can be found on the Android Options tab. Once this option is set, we should be able to compile again and see more detail about what is happening. If we look at the MSBuild output (output window on Visual Studio), we can find the error or exception that can provide more insight on the problem. For this case, we can see that there is an error associated to the proguard tool. The error reads that there is an unknown option on the configuration file proguard.cfg. If we look carefully, we can see that there is a funny character on the error message. This leads us to think that there is some junk data in the proguard.cfg file, or there is an encoding problem. The proguard tool does not handle files that contain Byte Order Mark BOM. Visual Studio creates files with this information. The BOM is used to indicate the file encoding type. To see and remove that encoding, use a tool like Notepad++ and save the file without the BOM encoding which is a menu option when saving the file. Hopefully this can help solve similar errors when building Xamarin Android Apps. All browsers provide a way to identify their information using the Navigator UserAgent property. This property tells us the type of browser that is running the application like Internet Explorer, Safari, and Chrome etc. Notice that on the GetDeviceInfo function, we get both the MAC and IP address and return the information as a delimited string similar to the format used by most browsers. This enables us to parse the information and display/use it as needed. The console log should print out the content of the string with a pattern similar to aa-bb-cc-dd/100.10.0.0 which represents the MAC and IP address of the device.